MAR 24 2019: Default Folder X 5.3.6 fixes problems with SteerMouse, Keyboard Maestro and macOS Spaces. Our thanks go out to Takanori Taniguchi, Ronald Leroux, Eberhard Woentz, and Mogens Thyregod for their localization help. MAR 22 2019: App Tamer 2.4.4 corrects problems with unexpected quits and unnecessarily high CPU usage. 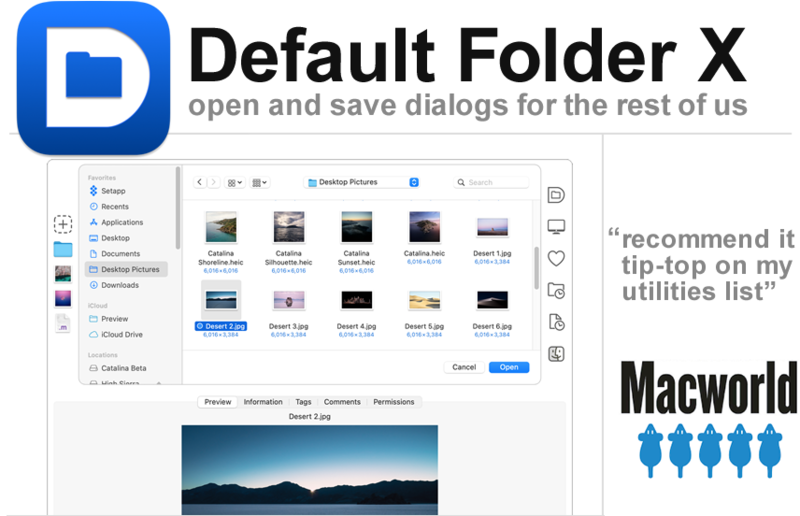 MAR 13 2019: Default Folder X 5.3.5 interoperates with HoudahSpot, improves compatibility with CopyPaste Pro, LaunchBar and Mojave's screenshot utility, and enhances its Finder drawer and folder-switching abilities. 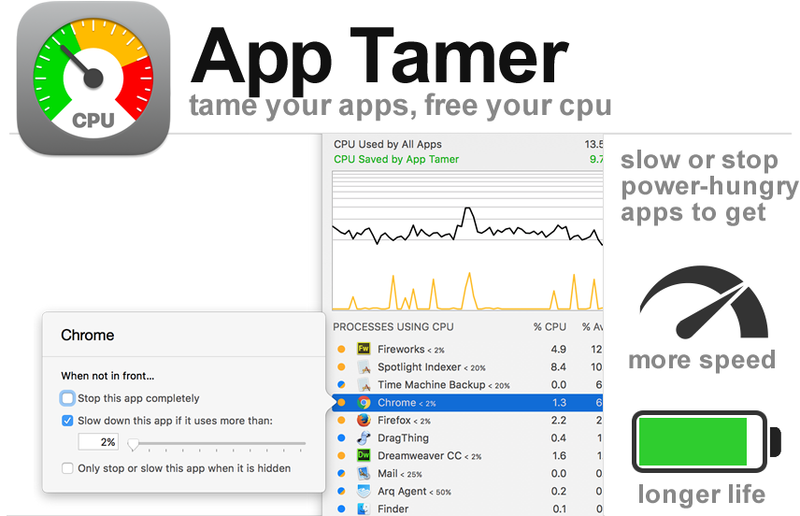 MAR 06 2019: App Tamer 2.4.3 adds the option to let applications run at full speed while your Mac is otherwise idle. JAN 24 2019: Default Folder X 5.3.4 corrects a number of issues with the recent 5.3.3 release, including confusion over privacy settings, crashes on macOS 10.11, an errant contextual menu and a graphical glitch. JAN 21 2019: Default Folder X 5.3.3 adds labels to its toolbar and drawer, introduces new keyboard shortcuts, supports the SetApp version of ForkLift, and addresses a number of issues. JAN 13 2019: HistoryHound 2.0.1 corrects issues with window resizing, Mojave's Dark Mode, App Store licenses and a couple of crashing bugs. JAN 03 2019: App Tamer 2.4.2 refines its user interface, fixes background scrolling and more. DEC 18 2018: HistoryHound 2.0 delivers Mojave compatibility, support for Vivaldi and Brave browsers, smarter network usage and a number of compatibility fixes. OCT 25 2018: Jettison 1.7.2 fixes a single bug that could prevent valid serial numbers from working. Thanks to pair Networks for web hosting and FastSpring for payment services.